A new publication available through K-State Research and Extension provides water use information for various crops in Kansas. MANHATTAN, Kan. – Common questions agricultural producers in Kansas have regarding water use typically relate to conserving the Ogallala Aquifer in the western part of the state and reservoir sedimentation concerns in the eastern part of the state. Beyond wanting to know the range of water use by particular crops, producers sometimes question why and how crops use water. They may inquire about what causes crop water use to fluctuate. K-State Research and Extension agricultural engineer Danny Rogers fields many of these questions and in the past has pointed producers to different research-based crop production handbooks to explain his answers. This is why Rogers and several of his K-State colleagues recently consolidated crop water use information for common Kansas crops—corn, sorghum and wheat as examples—and included this in a single publication that speaks on maximizing irrigation efficiency. The publication, titled “Agricultural Crop Water Use,” is available now at local extension offices and online. Other daily water use fluctuations depend on the type of crop, its stage of growth and weather conditions, Rogers said. Daily fluctuations over time develop seasonal water use fluctuations. This recent agricultural crop water use publication, part of a series of publications covering irrigation management, includes these causes of water use fluctuations and more. Crop water use is also referred to as evapotranspiration (ET) demand, water demand that considers the combination of evaporation and transpiration. Evaporation is the water that moves from the soil or leaf surface to the atmosphere, while transpiration is the water that passes through, which the plant uses for cooling and growth. Simply put, crops that are smaller and in the early stages of growth require a lower ET rate, Rogers said, at least until they start to go into the dry-down phase at the end of the growing season and will again use less water. Weather conditions, however, play a more complex role in water use. Rogers said this is why irrigation data calculated in KanSched, an irrigation scheduling program for producers provided by K-State’s Mobile Irrigation Lab, are used to make recommendations on water adjustments so crop needs are met without using excess water. Seasonal crop water use variations for a specific crop are often due to year-to-year weather conditions and the specific variety of a particular crop, especially its maturity length, which often factors heavily into a producer’s decision to grow a particular crop. Leaf area index (LAI) is important, Rogers said, as plants that fully shade the ground are intercepting solar energy that drives transpiration and maximizes water use. LAI is the leaf area of the crop per unit of land area. Producers tend to understand the leaf area index if you stripped all the leaves off of a plant, placed them on the ground and determined the square footage of cover. Yield and crop water use are linearly related for given growing conditions, so more water drives greater yield, he said. 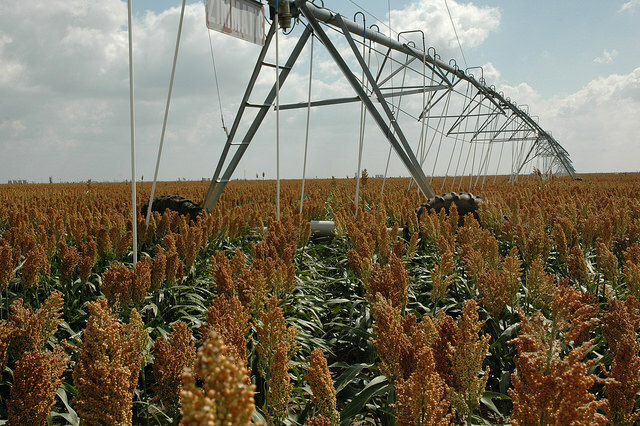 Although lowering plant production reduces water use, it also reduces yield. Finding a balance is crucial, and considering LAI can help. “We want to make sure to utilize all the light energy, nutrients, water resources and the land area to optimize crop production,” Rogers said. Log on to the K-State Research and Extension Bookstore for the agricultural crop water use publication and others in the irrigation management series.